2017 seven CD box. 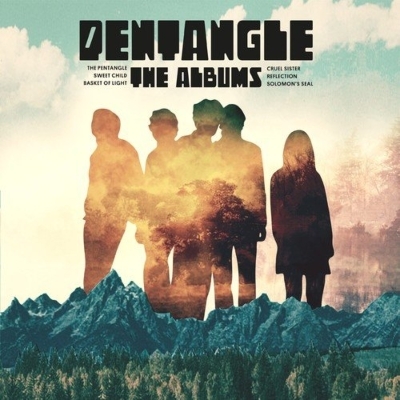 When they formed in 1968, Pentangle were hailed as folk's first supergroup, fusing elements of jazz and underground music and comprising the twin guitar/songwriting talents of Bert Jansch and John Renbourn with bassist Danny Thompson, drummer Terry Cox and singer Jacqui McShee. Between 1968 and 1972, Pentangle issued six albums - five on legendary Folk label Transatlantic and a swansong release on Reprise. Their debut, The Pentangle (1968), was hailed as a folk rock classic and charted in the UK at #21. Sequel Sweet Child (also 1968) was an ambitious double album coupling live and studio discs. Third LP Basket Of Light (1969) was their most commercially successful, peaking at No. 5, fueled by the success of lead track 'Light Flight' (the theme to TV series Take Three Girls). Cruel Sister (1970) allowed Pentangle to reinterpret traditional folk songs. Reflection (1971), their last Transatlantic LP, was also among their most adventurous. Solomon's Seal (1972) proved to be their last album with the original line-up. . For the first time ever, these albums are available as a deluxe box set to coincide with the 50th anniversary of the band's formation. Each album has been expanded with a wealth of bonus material, including choice selections from contemporaneous solo LPs by Bert Jansch and John Renbourn, out-takes and live tracks.